We just can't get enough of Kareena Kapoor, who is vacationing in Maldives with family. Kareena, husband Saif Ali Khan and son Taimur's pictures from the holiday are all over the Internet and here are some more to brighten up your morning. 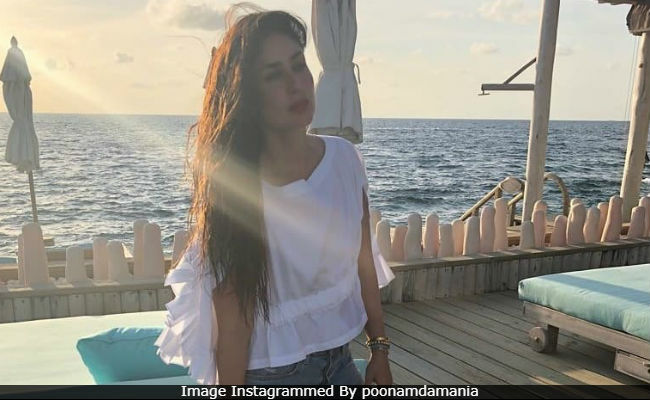 Kareena's sun-kissed picture is definitely what you want to see today. Dressed in a chic white top and denims, Kareena poses for a sun-kissed picture, amidst a breathtaking background. The post was shared by her manager Poonam Damania, who wrote on Instagram, "My diva killing it in Maldives... Major missing... Love you my, Bebo." Kareena has teamed her look with a red lip colour and a trendy tote bag. ICYMI, here are Kareena, Saif and Taimur's picture from a pool. They are accompanied by Saif's sister Soha, her husband Kunal Kemmu and their daughter Inaaya Naumi. We also spotted a photo of Saif and Taimur strolling on the beach. "Hand-in-hand - feet in sand," wrote Soha. How cute is Taimur's playdate with cousin Inaaya?